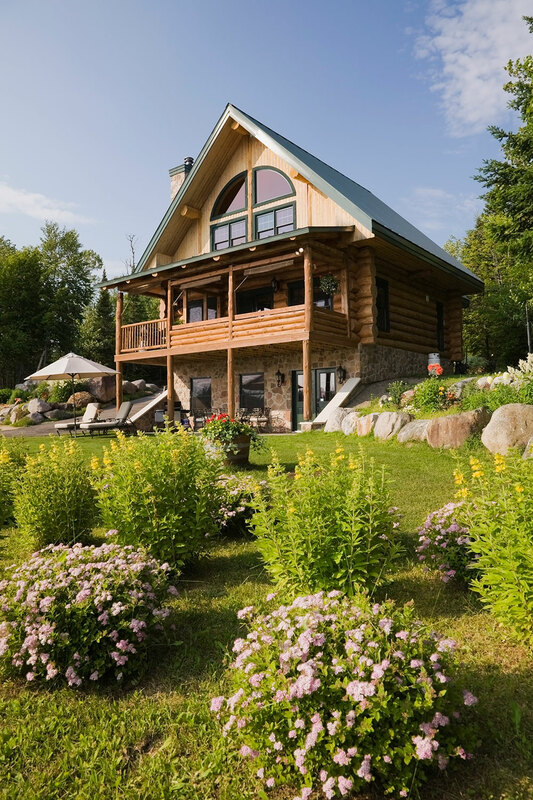 “Good things come to those who wait.” This was definitely the case for Paul Perron, owner of this Scandinavian-style log cabin and a living embodiment of the maxim. “I always wanted a log cabin, but I also wanted it in the right location. It’s not something you build just anywhere, like next to modern houses, for example,” he explains. Paul was looking for a secluded spot with no neighbors in sight; somewhere close to a main thoroughfare for easy access, flat terrain to build on and a sizable lot with a private road — quite a tall order! The existing private road was essential; being a real estate agent, he knew how difficult it would be to get a road-construction permit from the municipality. His profession should have made his search quick and easy, as he had ample knowledge of many properties for sale in the Laurentian region where he was looking. Still, it took him 15 years to find his ideal location. 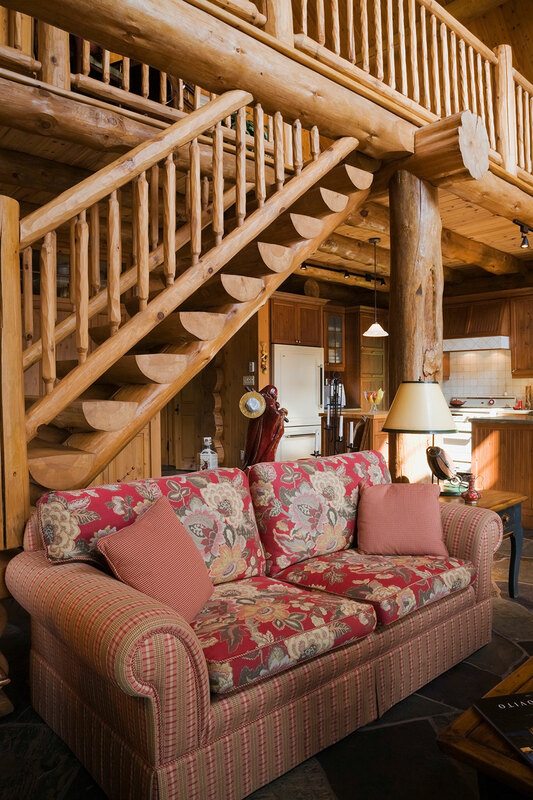 Set on 180 acres near Saint-Donat, the cabin overlooks a private lake and is surrounded by forest teeming with wildlife. It’s modest in size, 30-by-38 feet with an 8-foot balcony running the width of the cabin. The double-door two-story garage that sits next to the house is almost as big. Both buildings nestle perfectly in the area’s natural surroundings. 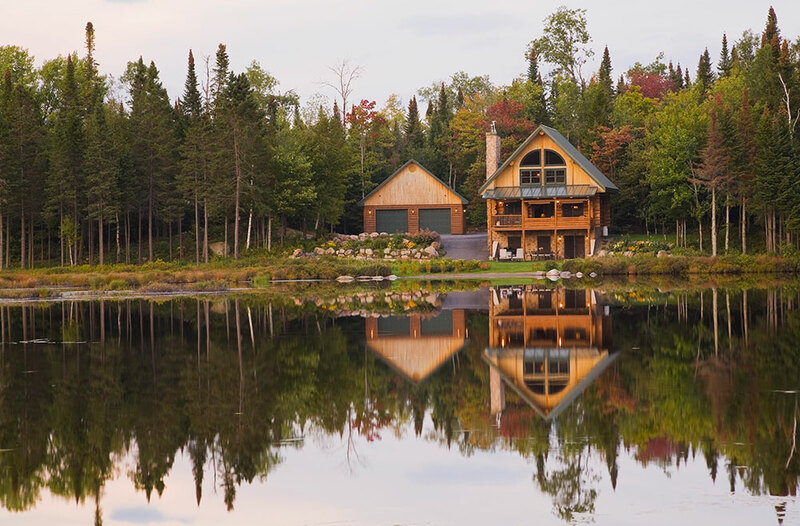 The cabin uses Swedish-cope logs that are round inside and out with a half-moon-shaped cove on the bottom. 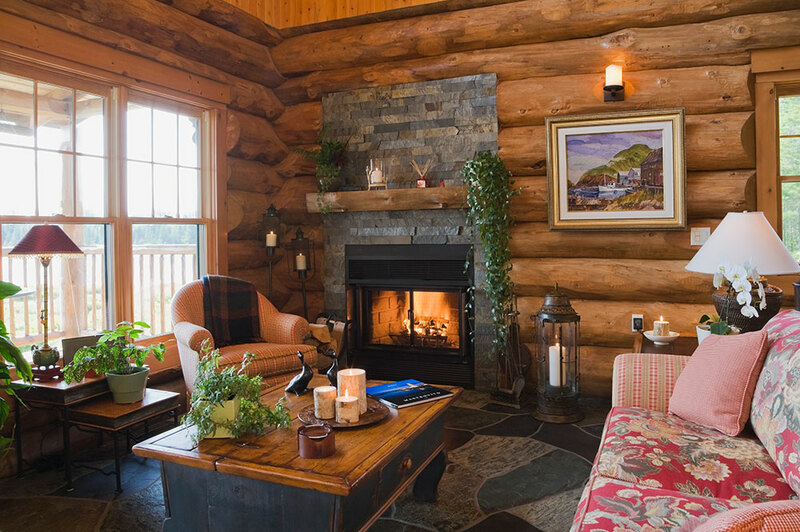 The corners of the stacked log walls are saddle notched — a traditional corner style in a Swedish-cope wall system. 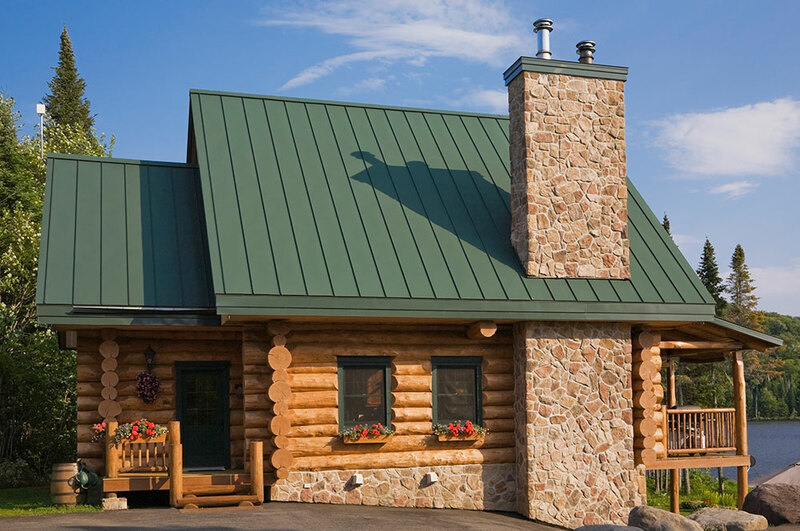 To avoid snow accumulation during harsh Canadian winters, Paul chose a steeply pitched metal roof with a thick layer of insulation to keep the interior toasty. 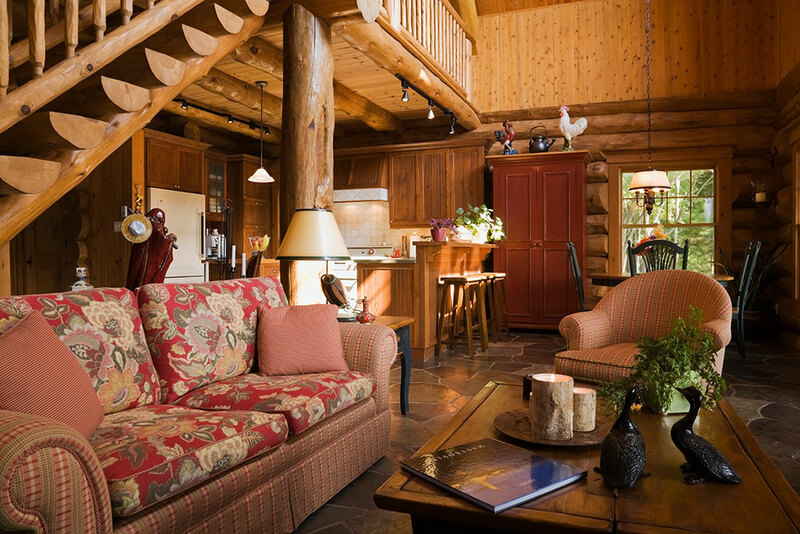 Inside, the ambiance could best be defined as rustic elegance. The ground floor (consisting of the kitchen, dining area and living room) is made of slate. The stone also dominates the wood fireplace in the living space. Its durability and resistance to cracks, scratches and chips makes it a solid choice for high-traffic/high-use areas. And since it transmits heat evenly and efficiently, it’s a perfect complement to the home’s radiant in-floor heating system. 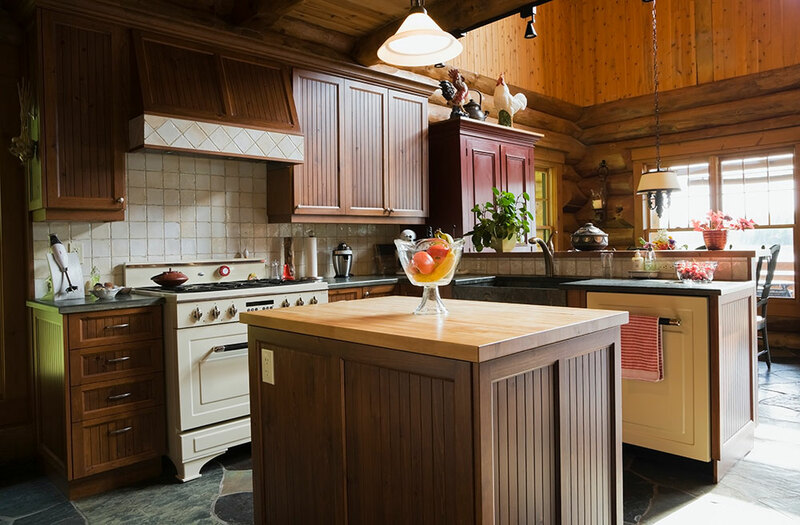 Mirroring the look of the floors, the kitchen’s countertops and sink are also made of slate, while the island boasts a butcherblock top to tie in with the pine log walls and cabinetry. The stove is something of a hybrid — the range uses gas and the oven operates with electricity. The coordinating white paneled appliances bounce light around the room and are a welcome respite from the more expected stainless steel variety. With its southwest orientation, the Canadian cabin receives plenty of sunlight, and the house plants are grateful. 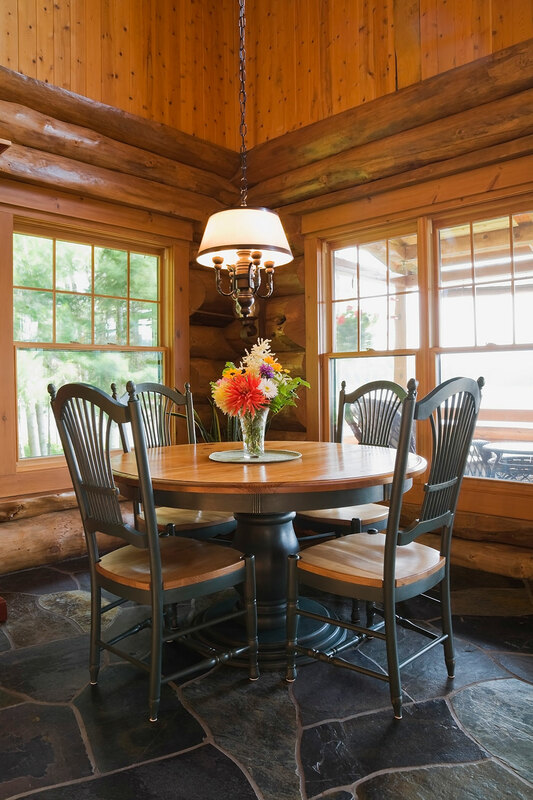 The dining room receives light from a side window and a larger four-pane panel set high up on the wall facing the lake. On this side, the 23-foot walls end in a cathedral ceiling and add to the small home’s bright and airy vibe. Flush with the ground, the family room gives direct access to the lake from the patio doors. Like in the living room, the wood fireplace is set in slate, but the floor is covered with ceramic tiles in various shades of pastel colors that match the fabric of the two sofas. It’s a cozy room decorated with style. From the mezzanine, one sees the stairs’ hand-hewn banisters and spindles. No two spindles are alike. The mezzanine is Paul’s private domain. A queen bed occupies most of the space in the cozy master suite. 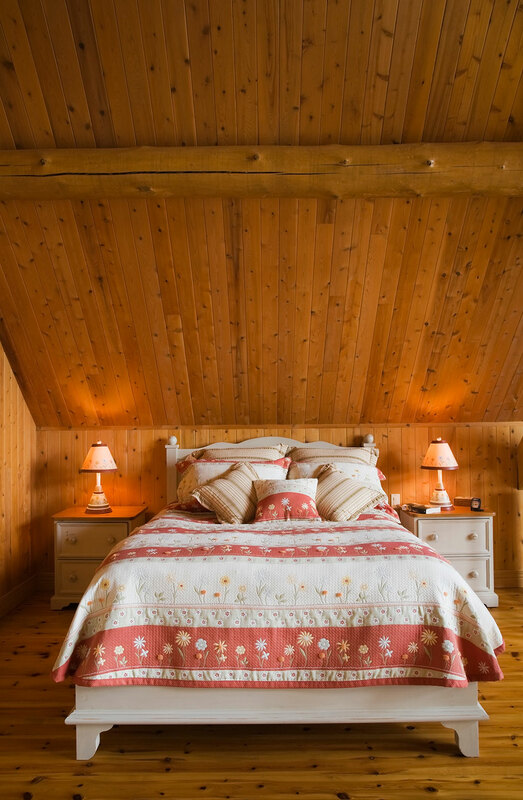 White furniture and a red-and-white, country-style bedspread with matching pillows make the ensemble pop against the natural wood tones. 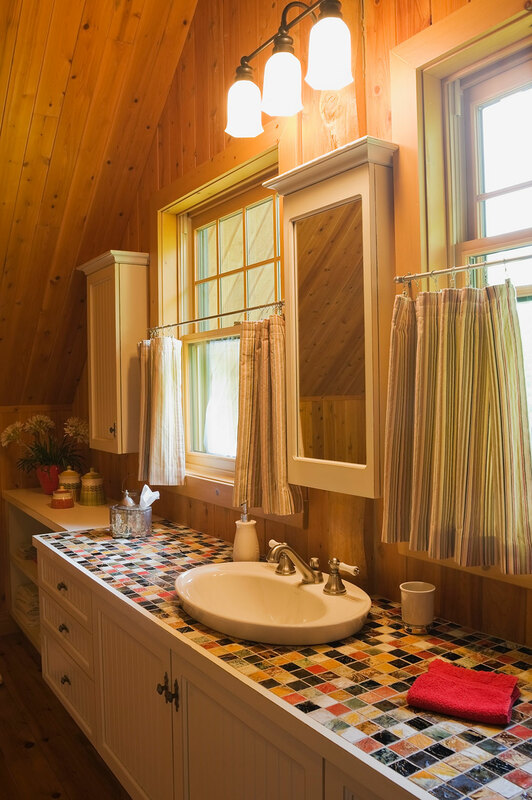 A similar color scheme is found in the en suite bathroom, where the white cabinets and red accessories contrast against the knotted pinewood boards. Small, multi-colored ceramic tiles cover the countertop. The large shower stall is lined with white tiles and the custom-made glass door follows the angle of the roof. After waiting nearly two decades before moving into his charming log cabin, Paul now makes the most of his enchanting retreat. Four motion-activated cameras placed in the surrounding forest have captured deer, moose, raccoons, groundhogs, game birds and even a mama bear and her cub. As he is not a hunter, all creatures great and small are welcome — and quite safe — in his neck of the woods. Paul, now 76 years young, canoes the lake and takes long walks around his property to stay in shape. Unobstructed by light pollution, the nights are pitch black, offering the perfect setting for stargazing. Thanking his own lucky stars that he finally found the perfect spot for his cabin oasis, Paul’s patience has certainly paid off. 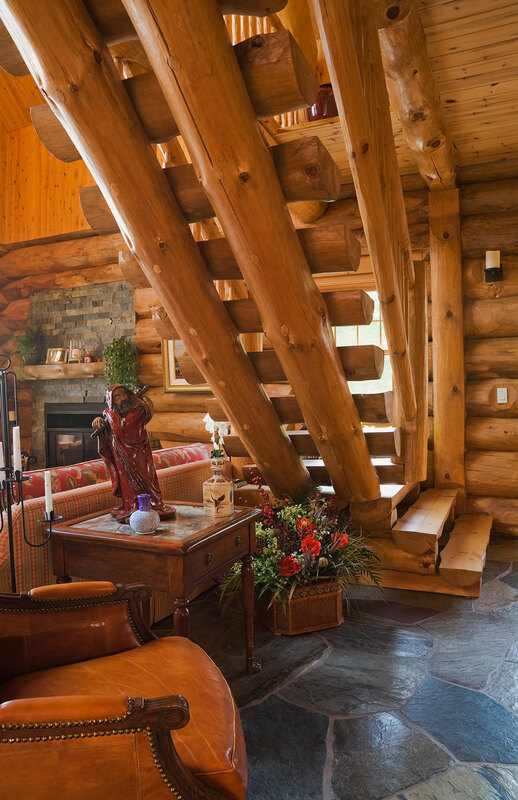 The cabin’s sculptural staircase, which leads to the mezzanine, is supported by two imposing-looking log posts. The steps are made of half-moon beams. 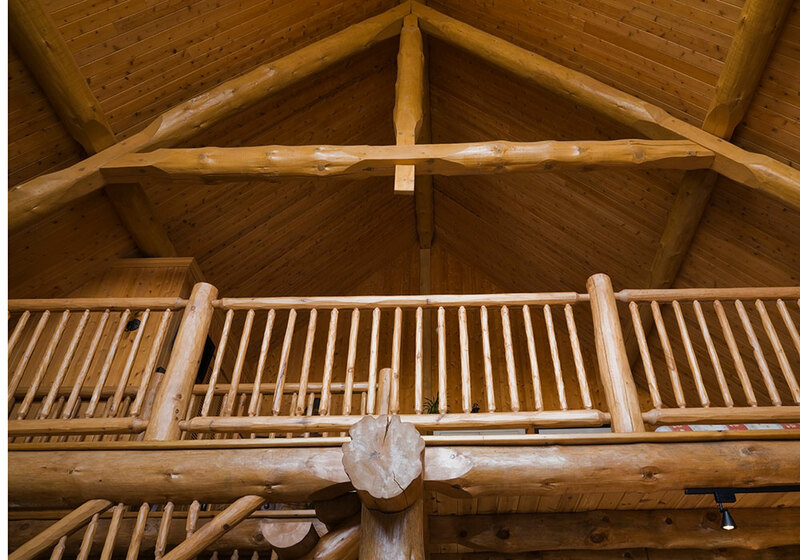 The banisters and spindles are hand-hewn, making each one unique. The late afternoon sunlight intensifies the red tone of the armoire in the dining room. 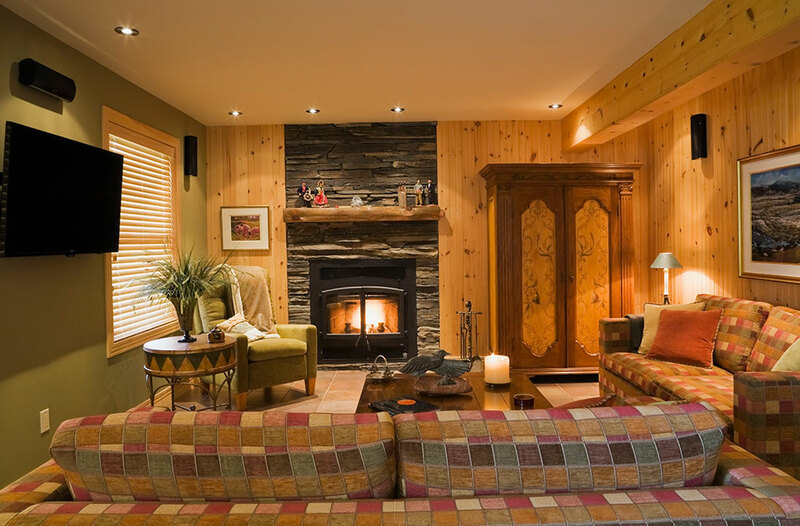 Colorful accents pop against the neutral backdrop of the log walls. 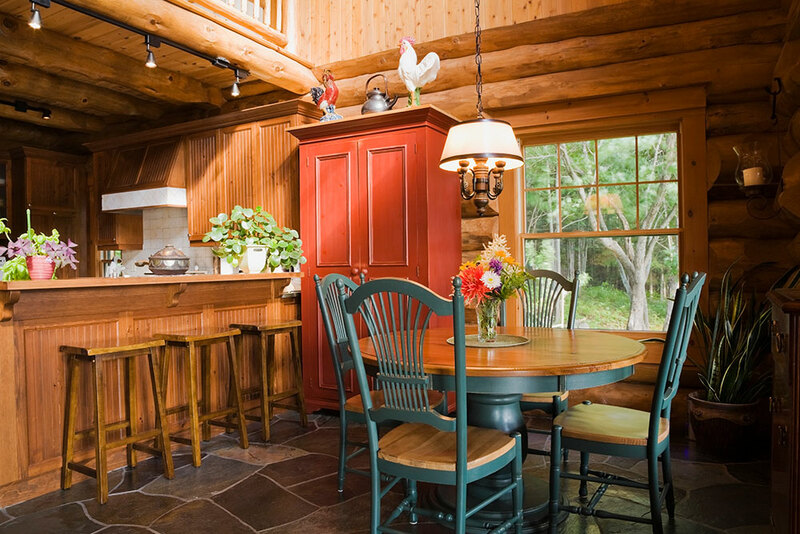 The cupboards in the kitchen are made of pine and were stained a darker hue to make them stand out. The family room’s wood-burning hearth is set in slate, and the floor is covered with ceramic tiles that almost match the sofa fabric. The queen-size bed with its country-style bedspread and matching pillows occupies the center of the 20-by-30-foot master bedroom. 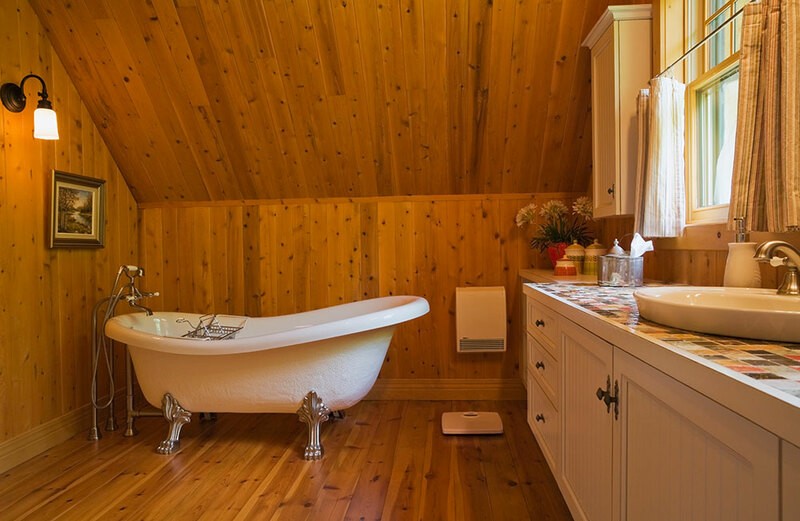 The master bath’s claw foot tub adds vintage charm.